Description: This volume is a collection of the author's studies on themes in Deuteronomic history, the lamentations, monotheism, and the prohibition of images. Besides methodological and hermeneutic elements, the essays explore issues related to reception history and theology. The book includes Frevel's papers about all parts of the canon, including Gen. 34, Exod. 18, Deut. 34, Josh. 23, 2 Kings 17, Ps. 8, 95, 104, Lam. 1 and Lam. 3. 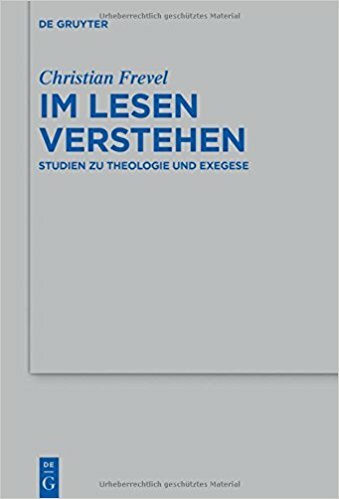 Citation: Stephen Germany, review of Christian Frevel, Im Lesen verstehen: Studien zu Theologie und Exegese, Review of Biblical Literature [http://www.bookreviews.org] (2019).